Yesterday was a day spent drawing, cutting, fusing, painting and stitching. Just fabulous! Here is a sneak peek. The fish are reverse appliqued, then the body is painted with shimmer paint. I have only applied it lightly as I didn’t want to create a strong colour difference, just to add some shine. The white dots are shimmer paint too. They break up the strong purple. Usually I would add the stitching details as a part of the quilting. 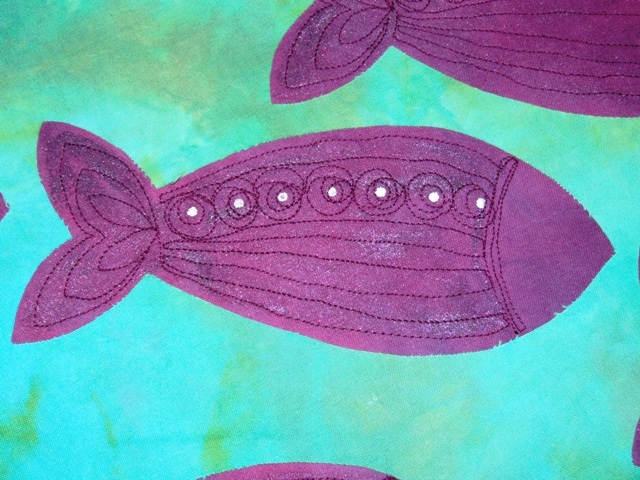 This time I stitched over the fish first so that they won’t flatten when they are quilted. I think that today I will head for the bead shop. These fish need beads! Don’t you think so? this looks like the begining of something exciting. looking good!! this lady has a range of cool fused quilts with hand dyes…. p.s- now i’m on holidays, i’m starting to get addicted to flicking through the blogs!! I like those purple fishies! And you’re right, they definitely need beads. Flo I told you that a computer is the essential quilter’s tool. You reeeeally need one!!! I really like those fish! Hope you post the pics witht he beads- please? Agree about a quilter needing a computer… but I seem to have stopped sewing- I am having too much fun checking out blogs! Some really great ideas to be had, though, for when I get over my stitcher’s block! Thanks for visiting Meggie. Bought big beads so they’ll be quick to stitch. Will have to quilt before I bead so don’t hold your breath for photos!